It was beginning 2005 I saw article in internet about virtualisation using Windows Virtual PC software. After few weeks I started looking around for software which supports Novell Netware and Linux as a VM and I found VMware and VMware workstation – which I still use in my HomeLab. That’s how I started. Next step was a small implementation of VI 3.5 (2 nodes + vCenter) – this was a big deal for me at that timeJ. I got my first VMware certification VCP3 in 2007 and next step was VCDX. As always my professional goal was to become an IT Architect I thought that having VCDX accreditation would help me to achieve that goal. 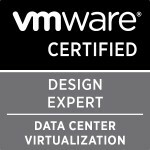 I started my VCDX journey when I was working at IBM (2008 – 2011 Brno, CZ). During that time I met Stephane Bourdeaud (IBM Architect), he was an account architect on one of the IBM customers which me and my team in Brno provided support on. Thanks to Stephane I started doing VMware designs for IBM customers, we spent tens of hours hanging on the phone talking about my designs. Thank you Stephane one more time. I finish my journey in May 2012 on VCDX defence panel in Toronto. · Take your time and get experience in technology and design. · Make sure that you started you VCDX design project at least few months before submission dead line – good design is 50% of success. · Make sure you sent your design to peers for reviewing – is a must if you want to have your design accepted. · On defence itself, don’t get stressed, panellists are very friendly and very helpful. From a project, preparation for defence or defence itself perspective – I would do exactly the same way as I did. Why? Cause I passed on a first attempt. What I would do differently would be before I start a VCDX project I would find a company which would be interested in heaving VCDX certified on board and sponsoring whole project J, is quite expensive accreditation especially if you have to pay for everything (defence fee, travel, hotel) yourself, as I had to. Life after the VCDX? How did your company respond? Was it worth it. Not to enthusiastic, to be honest. Nobody even noticed I got VCDX. Categories: Certifications, VCDX | Tags: Certifications, VCAP, VCDX, VMware | Permalink. What I found was that initially after getting VCDX not many people knew what it was, but after a while they started to get it. For me at least it’s opened up a number of doors that wouldn’t potentially have existed before. I also know the VCDX Program Team are going to be doing a lot more marketing of this elite certification and hopefully that will raise awareness among employers and customers. I’ve started to see more customers specifying VCAP/VCDX as a requirement in their RFP’s. So this has to be a good thing for existing VCDX’s and also candidates that are aspiring to become VCDX.